Old mottled calf over boards, pigskin back, raised bands, with black morocco labels. 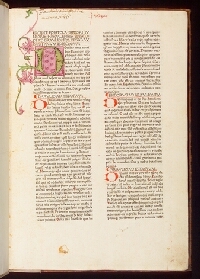 leaves (of 142), wanting a1 (blank); capital at book opening beautifully decorated; initials rubricated in red or blue throughout; occasional annotations in a later hand. 1. The Faculty of Philosophy at Vienna, 1686 (signature). 2. Boies Penrose (bookplate). 3. Boies Penrose II (bookplate), sold at Sotheby's sale, 1971, lot 121.